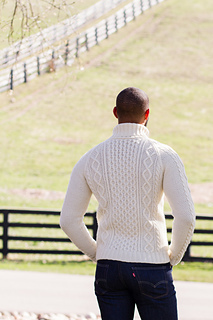 One of 6 patterns included in the Handsome: Man Sweaters for Every Body ebook. 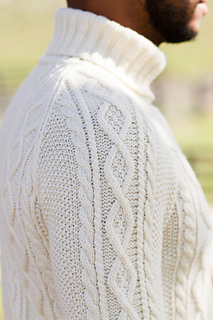 Robert is a classic Aran-style cabled raglan, equally well-suited to an afternoon coffee date and a month at sea. 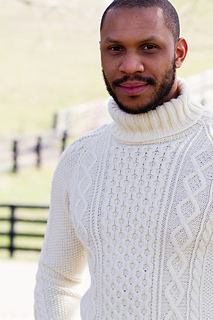 Although raglan sweaters are often worked seamlessly, this one is worked flat in pieces to achieve the best possible fit. 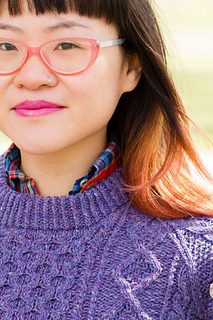 This project is great for advanced intermediate knitters who are comfortable with cables. Robert is written for 10 sizes, ranging from 34” to 66” finished chest measurement, and can be made as either a turtleneck or crew neck. 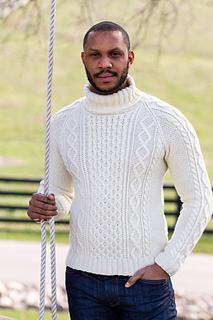 Like all 6 designs in the Handsome ebook, Robert comes with free calculators to help customize your sweater’s fit, including sleeve length, body length, and body shaping (A-line, V-line, or X-line). • 19 sts and 24 rows to 4”/10cm in Seed St on larger needles, after blocking. • 22 sts and 24 rows to 4”/10cm in charted cable pattern on larger needles, after blocking. 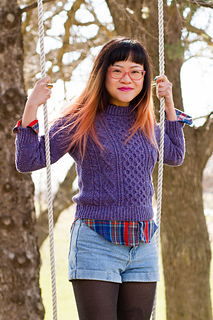 Remember that adjusting your sweater with custom calculators will change the amount of yarn required. Imperial Yarn Erin (100% wool; 225yd/206m per 4oz/113g skein). 6 (6, 6, 7, 7, 8, 8, 9, 9, 10) skeins. Green Mountain Spinnery Mewesic (100% wool; 180yd/165m per 2oz/57g skein). 7 (7, 8, 8, 9, 10, 10, 11, 12, 12) skeins. 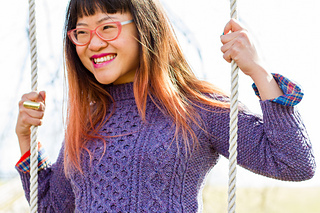 Jill Draper Makes Stuff Hudson (100% washable US Merino wool; 240yd/219m per 3.75/106g skein). 5 (6, 6, 7, 7, 7, 8, 8, 9, 9) skeins.